There are helicopter drones and fixed-wing drones, but creating a hybrid of both is tricky. Even Parrot’s Swing, as clever as it is, needs four propellers and elaborate wings to pull off its stunt. However, TU Delft (with backing from Parrot) has a far more elegant solution. Its DelftAcopter drone doubles as both a fixed-wing aircraft and a helicopter using only one propeller — its tailless biplane design lets it take off and hover vertically, but gracefully turn into a fast-moving airplane (up to 62MPH) at a moment’s notice. It’s an incredibly simple design that makes you wonder why someone hadn’t considered it for drones before. The machine is completely autonomous thanks to GPS, motion sensors and computer vision — it can pick a safe place to land all on its own. The prototype has a relatively long 37-mile range, too, and it can run for an hour on its electric motor. Contrast that with a typical quadcopter drone like DJI’s Phantom 4, which lasts for 28 minutes and tops out at 45MPH. 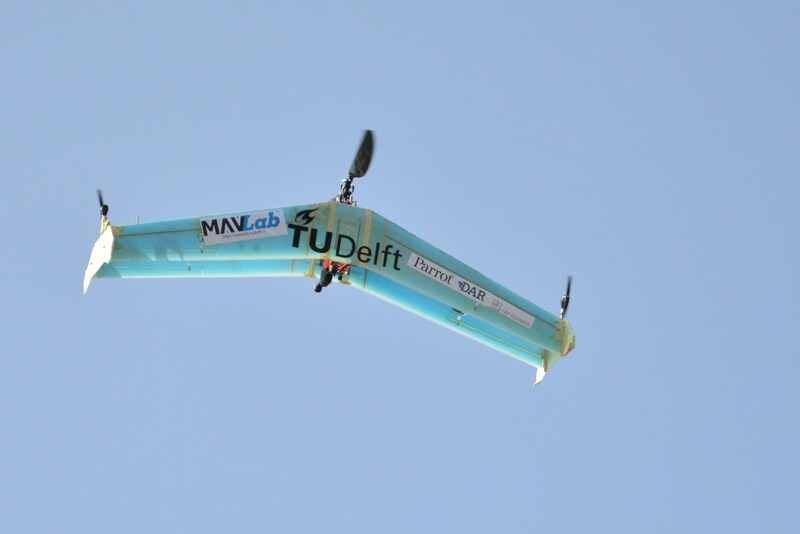 And unlike some drone experiments, TU Delft already has a clear idea of what its vehicle will do. The DelftAcopter would carry medical supplies to and from hard-to-reach places — you could deliver much-needed medicine to a flood zone. It’s not hard to imagine uses in search-and-rescue and recon missions, too. While it’ll likely take a while before you see the robotic biplane enter service (it only just got its first major trial run this week), it’s easy to see this invention saving lives. Share the post "Drone flies as both biplane and helicopter using one propeller"